Grime tells the story of a man fighting his disillusioned way to happiness through greed, manipulation and violence. He lives with his dysfunctional family in a make-shift, haphazard shack constructed on top of a burger van. Their complicated mesh of co-dependency, lies and deceit is all that holds them together. Grime follows the trials and tribulations of a family intent on survival in harsh times. Part absurd, part constructed reality Grime is a modern day soap opera that aims to push the boundaries of possibility. Ramshacklicious Theatre Company specialise in using traditional street theatre forms to create contemporary theatrical experiences for the outdoors. Founded in 2006 by siblings Jack and Holly Stoddart, the company aims to create work that is accessible and yet subversive. 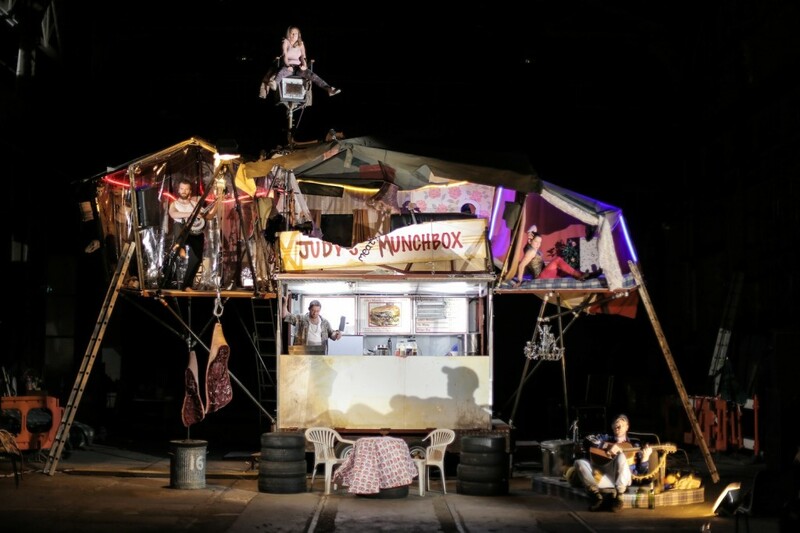 Ramshacklicious blend together live music, physical theatre, contemporary clowning, story telling, puppetry, circus and innovative design to create shows that take unsuspecting audiences on anarchic journeys into the unexpected.